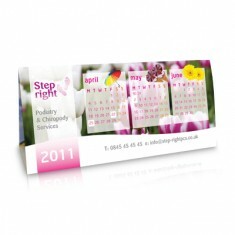 We have a HUGE range of customised Calendars all of which can be branded with your design. 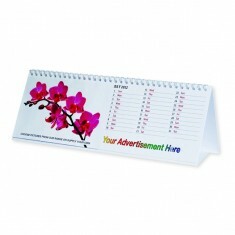 We can print your message and contact details on the header of every page. 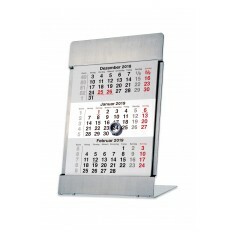 Whether it’s a branded desk calendar, one to hang off the wall or a small one with a stand, all of them are perfect for making note of those all important dates. 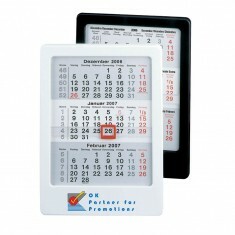 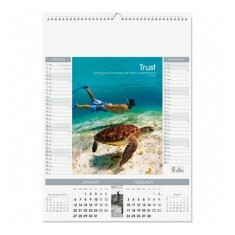 Due to the variation in sizes, personalised calendars have a wide range of uses. 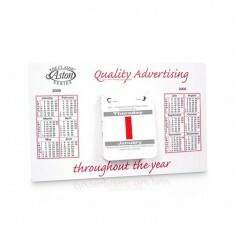 From hanging up in the staff room for marking down holidays and work events to our promotional Everlasting Calendars that will last long past the 1 year mark. 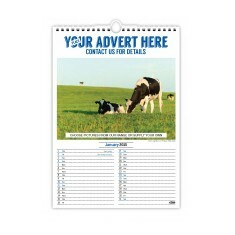 Please browse our selection to get a taster of the custom printed calenders we supply, if you cannot find the design you require please contact us for more information. 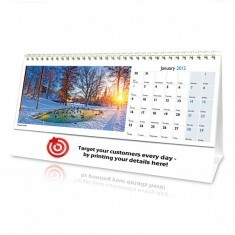 If you’re looking for a calendar that will sit in front of your customers every time they are at their desk, our custom printed Personalised Desk Calendar is one we would definitely recommend. 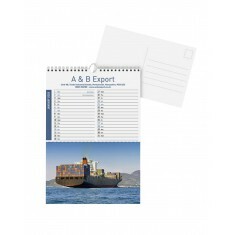 This calendar can have every month’s photo personalised with your design and makes a useful way to jot down any important meetings or dates that might come up, making it incredibly practical for anyone who receives this item. 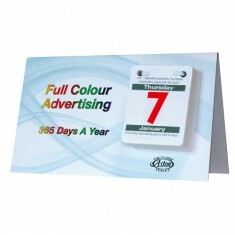 They’re great for any internal promotions to start the year off and even as mailouts to your loyal clients. 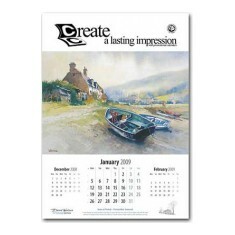 Plenty of our calendars even come with high quality images of everything from beautiful pictures of Britain to nature watching paintings Customised calendars are great for mailing out to clients at the end of the year or handing out at events to help your customers to keep track of all their important dates in the next year and make sure your calendar is kept on display for the whole year. 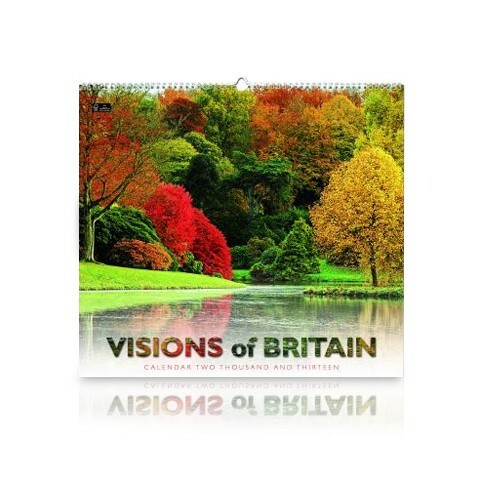 Browse through our collection above and if you have any questions, give our sales team a call who will be able to provide you with all the information you need. 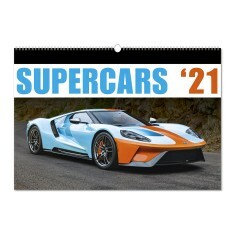 12 pages plus cover. 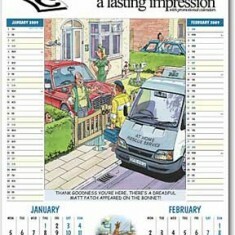 Gloss varnish on cover. 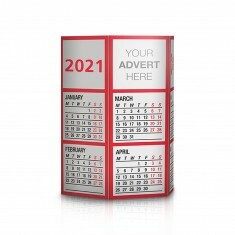 White wire. Keep up to date with our custom printed Smart Calendar Quad. 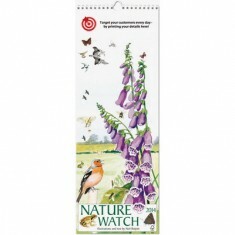 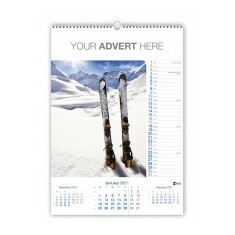 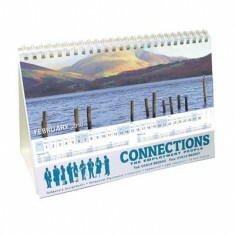 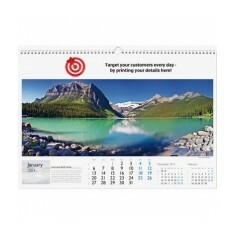 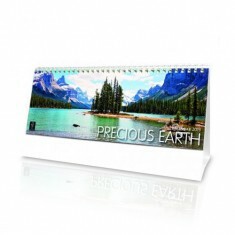 Made from 350gsm ..
Show off your images with our Panorma Easel Calendar. 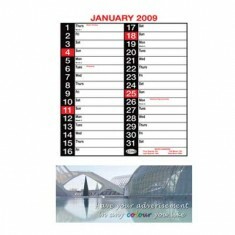 Contains 14 sheets of wh..
A4 13 page wall calendar with a tear-off postcard at the bottom. 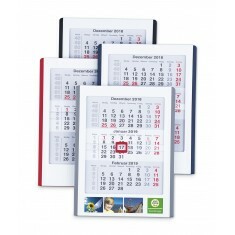 Can use own i..
12 pages plus cover. 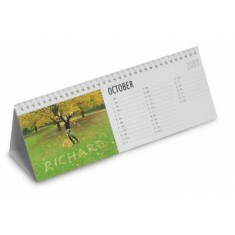 Gloss varnish on cover, spot varnish on leaves. 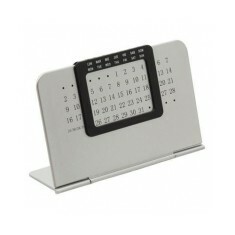 White wire. 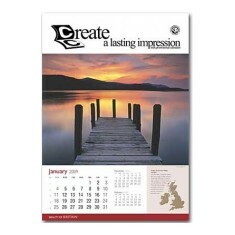 Don't let your customers forget you with our custom printed bespoke Wall Calen..
12 pages plus cover. 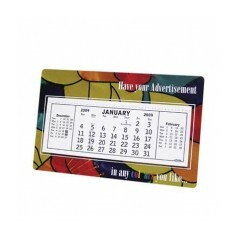 Acetate cover overlay and spot varnish on leaves. 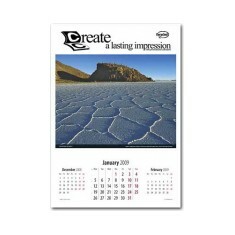 White w.. 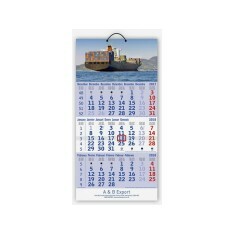 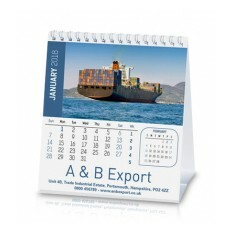 Compact Tri-Monthly Shipping Calendar with International Dates and Holidays. 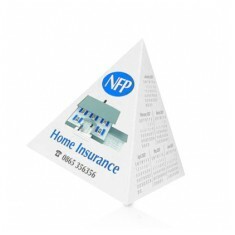 F..
Strong and durable. 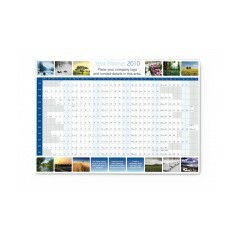 Can be printed with or without a calendar. 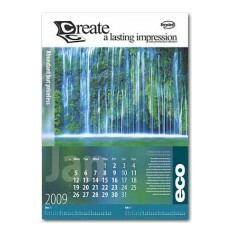 Supplied in env..
Large amount of stock images available. 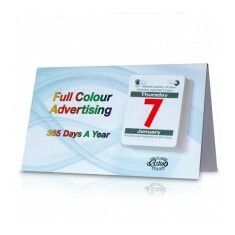 Branded in full colour. 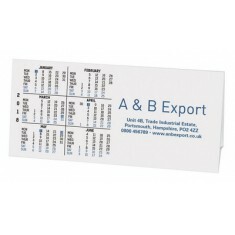 Supplied in envelopes. 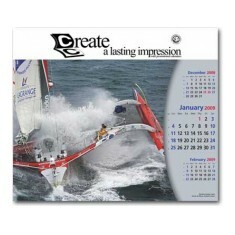 Large format Bespoke Wall Calendar featuring images selected from a large gall.. 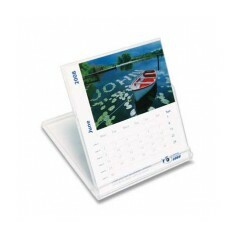 Simple but effective small tent style desk calendar. 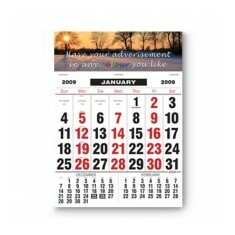 Features 6 months per sid.. 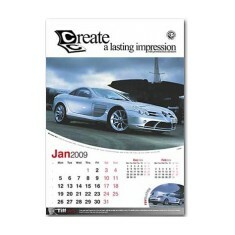 Printed on 300gsm card. 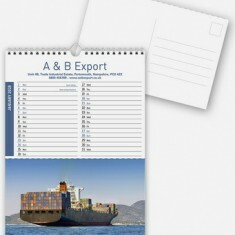 The image is perforated so it can be used as a postcar..